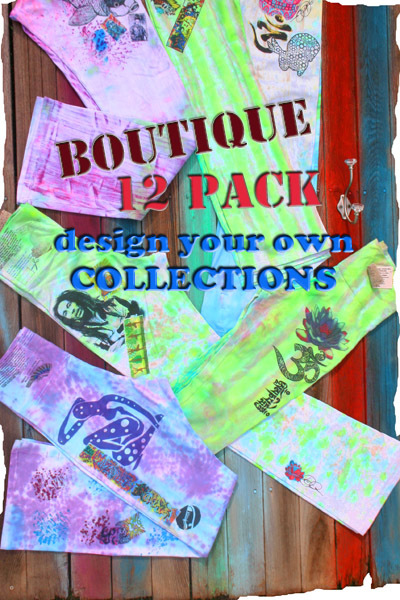 MANIFEST YOUR OWN YOGA PANTS & TEE COLLECTION! Don't worry, whatever you mention we will use as inspiration to create some amazing art for your pants and tees. You can have 12 unique and different items, or have us make 4 sets of 3. Previous customer theme examples include, "om", "elephants", "peace", "flowers", "Sanskrit", "graffiti". Anything is game! You can even upload your own logo or images if you like. 2nd- Sit back and wait 7-12 days for your one of a kind yoga pants and tees to arrive, slip them on, snap a picture for us. Just in case you are unsure of our supreme, practically divine skill to create incredible yoga pants and tees, click on the Image Gallery link above or our Online Portfolio to see so many more examples of beauty! What ever you may decide to create, what ever words of inspiration you put down above, keep in mind that the picture we create together will be superb!